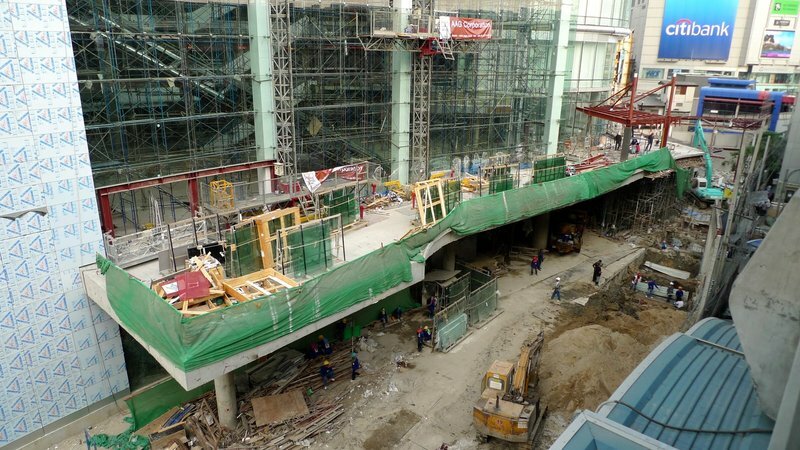 In November 2009 I first wrote about the construction of a new mall at the northwest corner of Sukhumvit and Asoke roads called Terminal 21. 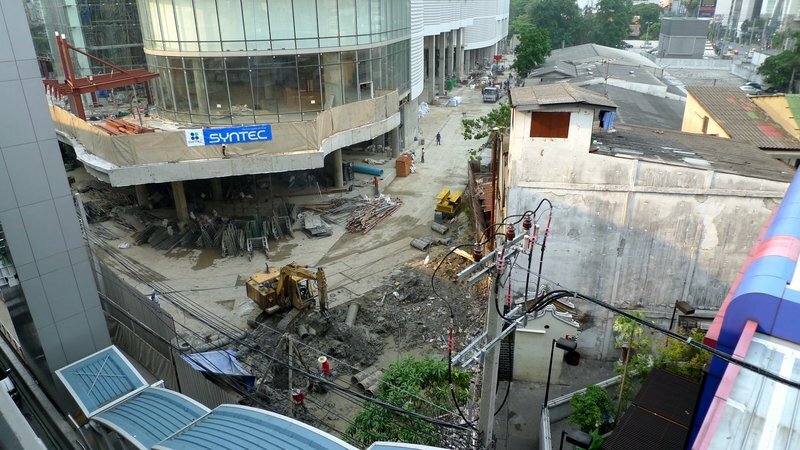 I visited the subject again in February of this year as part of an entry about the profusion of malls being built along Sukhumvit Road. 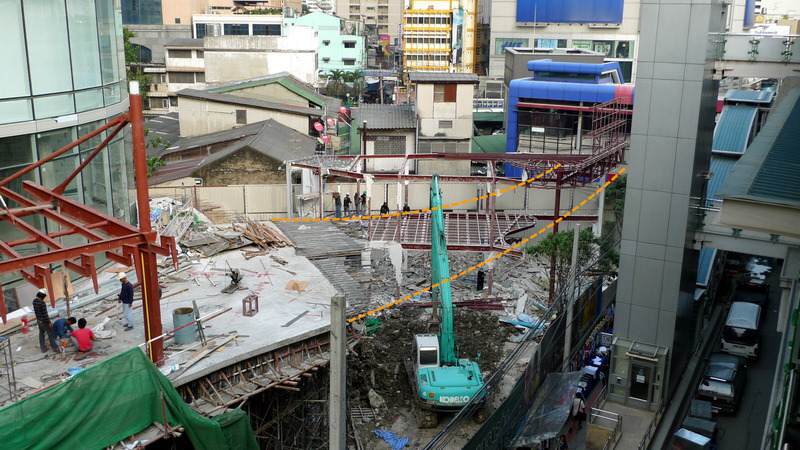 In the weeks since, I’ve stopped by the site, which is easily visible from the outbound platform of the Asoke BTS Skytrain station, to view the last steps of construction. Since the mall is literally right next to both the Skytrain station (elevated) and the subway station, it should benefit from easy access. But, in a city with strong sunlight, heavy rain showers, and lots of traffic, the more convenient and enclosed you can make that connection, the better. 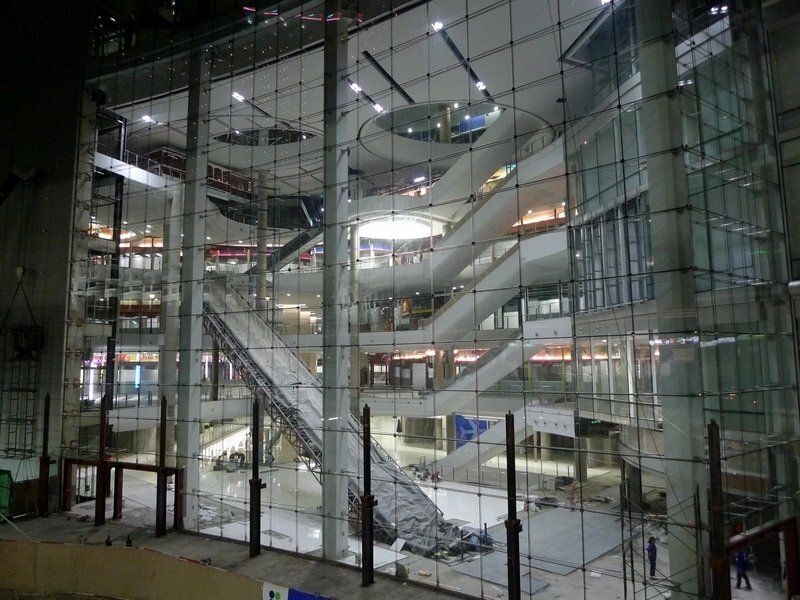 Because of that, one of the things I’ve been observing and thinking about is how the main entry area (shown above) will connect with the two rail stations. You can see the long concrete deck that will be the main entry area, wrapped in green construction netting. One entrance is on the left, outlined in red metal beams, and the other is at the right end where there is a bit of a canopy being constructed. On the west end of the deck, I can easily see how a bridge might be built to connect to the Skytrain station, which has blue-covered stairs seen on the left of the picture. In this picture, taken a few weeks ago, I anticipated the potential bridge with orange lines. Sure enough, by last week they were pouring the concrete reinforcements for the bridge and I imagine in another week or so they will be laying the beams for the bridge. This will lead directly to the entrance of the Skytrain station, which I fear is a bit small to deal with the amount of passengers that may be passing through the space. The more uncertain question is what they will do with the other entrance to the mall. 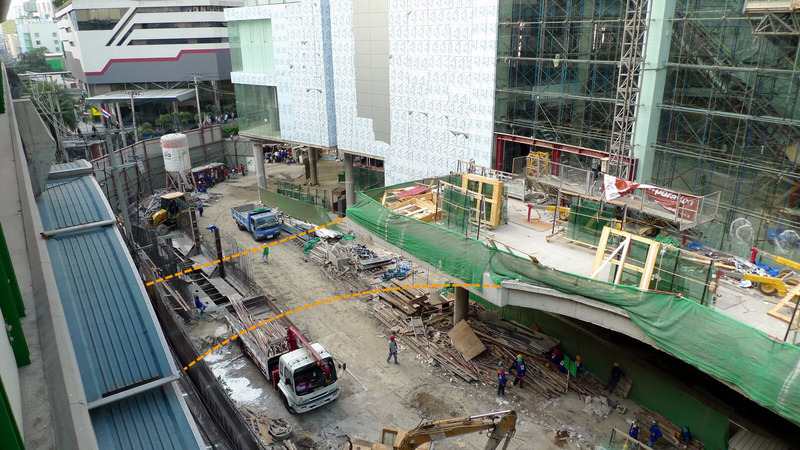 In the picture shown above, taken a few weeks ago, they were demolishing the sales office for the mall and I anticipated (in orange lines) that maybe a bridge would be built connecting to the escalators that descend to the subway. The escalators are in the building with the bright blue roof that has one red segment. While some re-jiggering of the wheelchair ramp in that area would be necessary, it seemed to be an easy way to get people directly to the subway, short of a tunnel leading into the station itself. After they demolished the former sales office and finished off the edge of the entry deck, it is no more clear what they will be doing. Certainly it will be some sort of bridge, but how it connects to anything else remains a mystery. Complicating matters further, there is a narrow alley you see in the photo above. This space contains a small shrine that belongs to the Asoke fresh market, located in the building with the dingy white-washed wall. Any bridge connecting to the escalators to the subway would have to cross over this alley. I guess there is little to do but wait and see. One other thing that caught my eye: there seems to be a “moat” built around the edge of the mall. The other day there was quite a bit of water flowing down it. Not sure if this is part of the drainage system and will be covered with grilles or what. The other night while waiting for the train after my Thai lesson, I noticed they had the interior lights on for the first time. It may be a bit hard to tell, but the interior is largely finished. They are laying the tiles on the main floor and most of the shop entrances are decorated already. I think they will be open in the next few months. 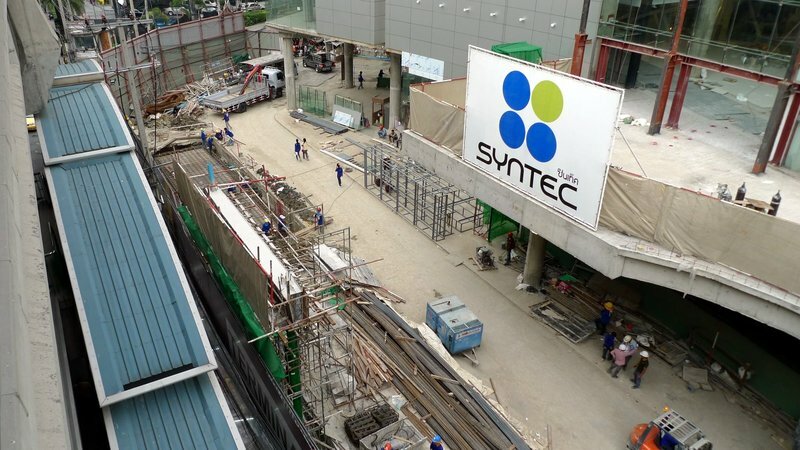 Not that far away from Terminal 21 – in fact, just two subway stops north along Asoke/Ratchadapisek Road – There is another mall being built. This is Central Plaza Rama 9. There is an additional development that is supposed to happen behind it – a large four-tower condo complex. In fact, the developer was floating the idea of building a monorail that would go down Ratchadapisek Road (to the right in the picture above) and connect with the Airport Rail Link terminal at Makkasan. The view above is looking east from atop Fortune Town IT Mall, with the Thailand Cultural Center off to the left and Rama IX road following the bridge on the right. Pardon the inexpert job done stitching three photos together to create this faux fisheye lens effect. This entry was posted in Uncategorized and tagged Asoke, Bangkok, Building, Center, central, Development, Krungthep, Mall, planning, Plaza, Ratchadapisek, shopping, Sukhumvit, Terminal 21, urban by christao408. Bookmark the permalink. I don’t understand the positioning of malls so close to each other. It is done here all the time and then suddenly stores being to move out. And there are for rent/lease signs in lot of empty store windows. Bangkok is shaping up! Wooot! More shopping and food courts to expore! Air-conditioned and will be nice in the hot and humid weather too! @Fatcat723 – Because that’s where the crowd is. It has become more of a shopping district perhaps. 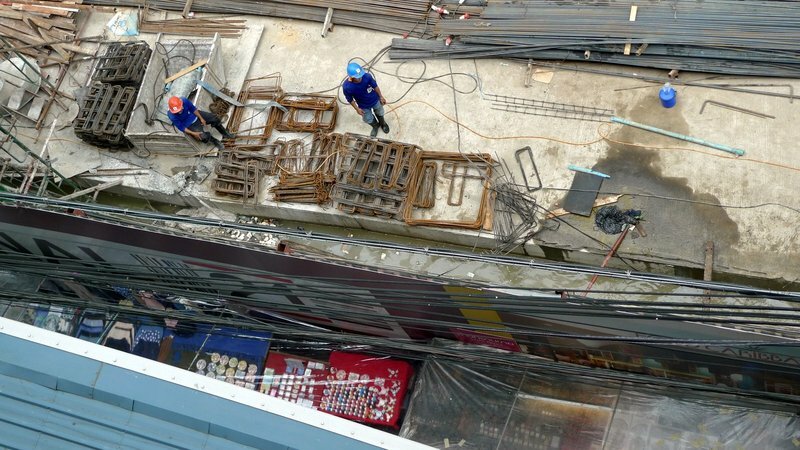 i’m always fascinated by construction work, too. i love watching things as they’re built, perhaps in a “behind the scenes” sort of way. looks like a cook place. Yeah, I enjoy watching the construction sites too- and to keep guessing how it is eventually going to be! I walked on the sidewalk that used to be there (before the construction). Wow, it is nice. @Dezinerdreams – I watched Disney Hall being built when I worked in Downtown LA. That was amazing construction, there is no straight line anywhere on the building. So much building! Are there enough consumers to support these? Only you can take the mundane of construction, and write about it in a way which feels like as if I am reading a phenomenal story. Love this post Chris. Thanks for your very kind words on my post. @Ricardo98 – I’ve seen that building. It’s so awesome! It would have been amazing to see it being made. That’s a lot of concrete. When the rains come, there’ll only be a couple of blades of grass and some scrawny trees to absorb them. I was watching this grow daily for two years whilst there and would stop and gaze from Asok BTS station and wonder what ot will be like sipping a Coffee and watching the world zip by from a cool coffee shp within. however I am in UK for a few months and looks like I will miss the opening oh well thanks ever so much for keeping me updated with great photos Christao I miss Bangkok so bad roll on the days!